Wedding reception activity pack for a child to keep them busy! 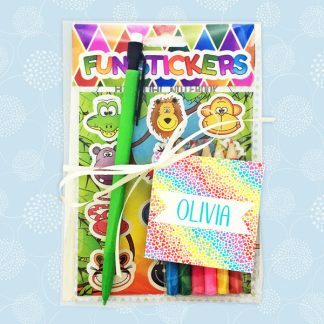 Contains a notebook, stickers,crayons, a pencil and a blank greetings card with the option to include a small bag of sweets too. 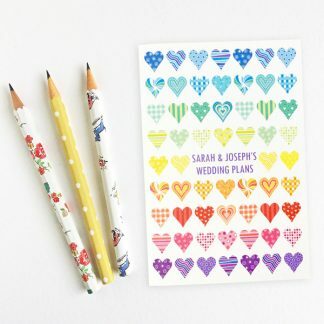 Supplied with a sleeve in one a design to co-ordinate with one of The Leaf Press wedding designs, with a colour scheme based on any two colours. The sleeve has the child’s name printed, and so can be used as a place name card. A wedding reception activity pack for a child – ideal for keeping them entertained at your wedding reception. The pack has a personalised sleeve to co-ordinate with one of The Leaf Press’s wedding stationery designs and so can be used as a place card and/or wedding favour for the child. A notebook/colouring book with blank pages inside. There are a list of suggested activities on the back of the notebook. A blank greetings card with envelope, in a cello bag. A sticker on the bag asks the child to design a card to give to the happy couple and on the back of the card is the text ‘designed by ……’. A mechanical pencil with rubber tip. A pack of colouring pencils (colours may vary from photo). A pack of stickers (designs will vary but be suitable for boys or girls). An optional small packet of Haribo starmix or equivalent. The contents have been designed to minimise the chance of a mess on the wedding tables or special wedding outfits! The sleeve is available in several designs, to co-ordinate with one of The Leaf Press wedding designs. 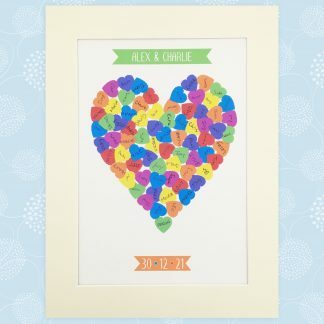 Each design has a colour scheme based on two colours, that can be chosen from the wedding stationery colours chart. The design on each sleeve is similar to that of a place card, so the wedding reception activity bag can be used instead of a place card for the child. Names for the wedding reception activity pack for a child can be supplied to The Leaf Press via email, a Word document or spreadsheet.